Is it easy for you to show hospitality to others? I would guess that most of you would respond, "no". Answering "no" tends to be the common response when I ask this question about the Christian's responsibility to show hospitality. So why is it so difficult? Why is it more common for people to be frustrated by the call to show hospitality than it is for people to embrace it? There are several factors that contribute to our reluctancy to show hospitality. So that we are all on the same page, hospitality is receiving and entertaining people. First, we fail to understand that we are all called to show hospitality. Second, we forget to take time to develop the skills. Finally, we have no plan or system ready when the opportunity presents itself. We cannot overlook the call to show hospitality. Scripture is laced with instances of God's people showing hospitality. Paul instructs Timothy that the elders need to be hospitable. In Romans 12:13 Paul describes the true Christian as someone who "seeks to show hospitality". In 1 Peter 4:9 we read that we should show hospitality to one another without grumbling. In Genesis 18 we find Abraham giving us the model of hospitality when he waited on the Lord and two angels. Throughout history Christians have been known by their hospitality and willingness to place others' needs before their own. These stories point us to how we are shaped by the gospel. If we are shaped by the gospel to seek opportunities to show hospitality, "When was the last time you entertained a guest at your house?" Chances are most of you that struggle with hospitality never allow yourselves the opportunity to show it. Most people have become so enamored with the individualism that rules our culture that we never invite people into our homes, much less hope that people will just stop by. We are more comfortable hiding in our "happy places" being content to live out our lives in relative separation from our neighbors and friends. Yes, it's is a scary proposition to allow people regular access to our homes. Yes, it means that you will have to sacrifice at times for the benefit of others. The problem exists not because we are incapable of showing hospitality, but because we practice the skills necessary to be hospitable. I realize that some people are more gifted at hospitality than others, but that doesn't excuse the rest of us. It just means that those of us who are not naturally gifted at hospitality need to be better prepared. My wife, Lindsay, says that we have to become "experimental extroverts". We have to be ready to show hospitality even when our natural tendency is to retreat from the opportunity. We have to have a plan of action to engage conversations instead of shying away from them. I'll leave you with a few practical steps to prepare you for the next chance you get to show hospitality. First, pray! Pray for the strength and gumption to step up the next time an opportunity presents itself. Pray that you'd realize your ability to engage instead of retreat. Second, make a list of questions ahead of time. Asking questions is the easiest way to engage with people and get to know them. Have practical questions ready and memorized so that you don't have to fret over what to say or ask next. Finally, put the plan into place. Talk to your new neighbors the next time you meet in the driveway. Instead of just saying "hi", engage them in conversation. 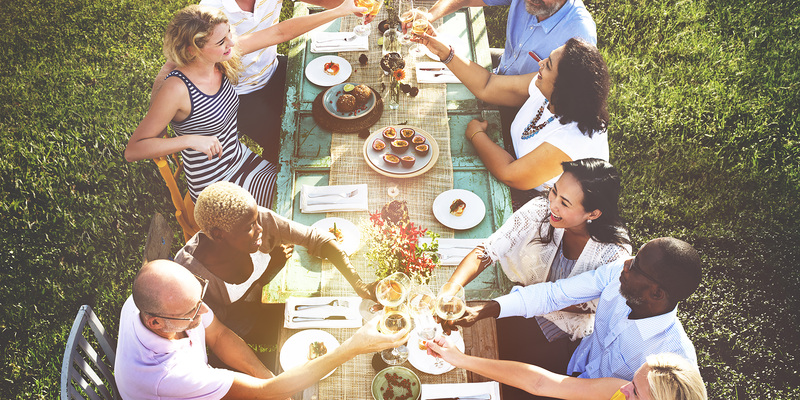 Allow yourself to practice hospitality by inviting friends or neighbors over for no particular reason. There is an extrovert in all of us waiting to get out. It'll take time and energy, but eventually you'll be able to embrace your calling to "seek to show hospitality." As you begin to practice hospitality your life will start to display the gospel through your relationships.